This weekend marked the completion of the final decorative touches to our master bathroom and I couldn't be happier with the finished results. What excites me even more though is that this is the first room that I feel like I can really cross off my list and declare "done" in the new house (as much as any room I ever design can be deemed complete as I'm always tweaking things). It's also the first room that I can really say is exactly as I had hoped it would be as the majority of my house is still incomplete. In honor of the occasion, I thought I'd give you a virtual tour of the room, from top to bottom. When I last updated you on my master bathroom, I was debating which light fixture to switch out the small, completely inadequate, ceiling light with. Well, after months of contemplating my options, I decided to go with: Neither! Ultimately, I felt that if I was actually that torn about which light to pick, I should just hold out until I found one that was exactly what I was looking for. And I'm so glad I waited. A few weeks ago I spied this fixture over at Aesthetic Oiseau and knew instantly that it would be a perfect fit for my master bath. As a major bonus, it was also well under what I had budgeted for a light fixture (I bought the smallest version, the three-light fixture). And, while my ceilings wouldn't allow me much room for hanging, I do think the hanging pendant brings a coziness to the space that a flushmount simply couldn't have. With all the hard tile (and all the white and gray!) in the bathroom, I wanted to bring in some softness and pattern in the form of fabric. Obviously, in a bathroom draperies aren't particularly practical, so after reading about Jenny's gorgeous pelmet boxes over at Little Green Notebook a few months ago, I decided to try making my own pelmet box to fit around our large, very bare window over the bathtub. Because the bathroom will obviously see a lot of moisture over the years, I decided that constructing my pelmet box out of foam core was probably not the best move (I could just image it starting to droop after a few months of showering!). So I decided to tear apart the plywood box that one of our mirrors was shipped in and reuse the plywood as the frame for the pelmet box. It took Dave and I several hours (and several attempts) before we got a product that I was happy with, but overall the project was fairly simple. We hung the pelmet with two L-brackets,which we hung just a few inches from the top on either side so they're now completely invisible. The fabric is Windsor Smith's Archipelago fabric in Haze. Normally this fabric is to-the-trade-only, but I managed to score it (at a pretty decent discount) from Avid-Home (which I heard about via Paloma over at La Dolce Vita). 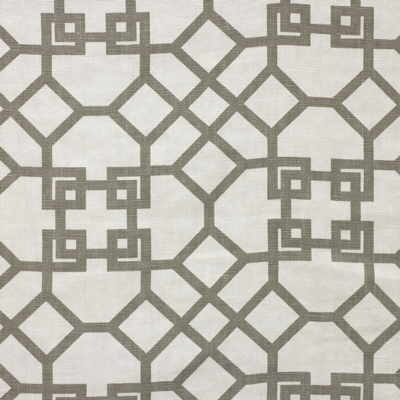 I love the fabric so much that I'm thinking about using the mist colorway for draperies in the master bedroom. 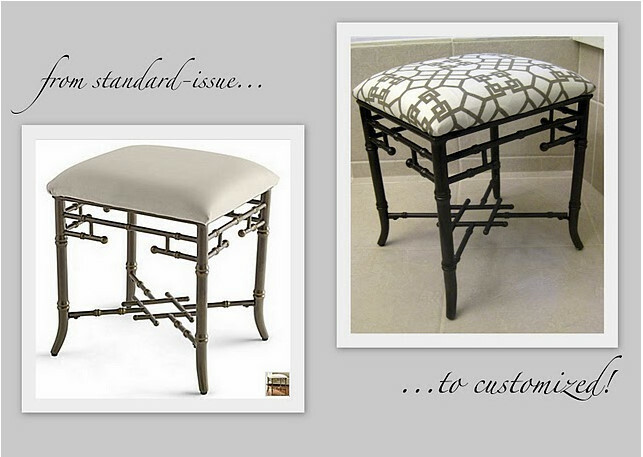 Beth has touted the virtues of this trellis foot stool (from, of all places, JCPenney's) several times on her blog Chinoiserie Chic. And, once it went on sale, I decided to pick up my own for the vanity in our bathroom, intending to recover the seat in the same Windsor Smith fabric as the pelmet box. When the stool arrived, I was pleasantly surprised by its sturdiness, but wished the base were in a bronze instead of a brushed gold (which is actually quite nice, I just didn't want to introduce another metal into the room). So I decided to pick up some spray-paint at Lowe's and give it a quick coating of bronze paint. I did a light coat to allow for some of the gold to come through, which I think gives the metal a more authentic, bronze look. And finally, I decided to cover the majority of the open floor with a rug because (1) those tiles are dangerously slippery in the morning, (2) I love the look of a real rug and not just a bathmat in a bathroom, and (3) our pristine white grout is a major b*tch to keep clean. 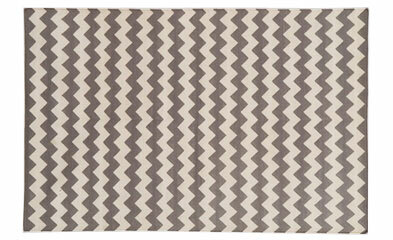 I chose the steel zig zag rug from Madeline Weinrib because I wanted to stick to the same neutral color palette, but go with a bold pattern that would really make a statement. As a bonus, the fact that the rug is a cotton flatweave should help it stand up to the dampness. So many thanks to all the bloggers mentioned who inspired specific aspects of this design as well as to all the other bloggers who have inspired me daily and helped me to better define my own sense of style. It's a great feeling to finally have an entire room more or less complete (even if it is just a bathroom). Next on my list: finishing up the living room. BRAVO!!! I love, love, love it. And the light fixture is perfect :) And it was so neat to read about how different blog posts helped you along the way - I'm finding that is true in my own decorating decisions these days. Great post...and GREAT bathroom! Wow, this is beautiful! You did a tremendous job! :) LOVE the rug! Excellent work on the pelmet box and the foot stool! They both have a great custom look. The light fixture is fab and, of course, I LOVE the rug! Congratulations on having a room complete - it's pretty (without being fussy) and serene. I think it looks fabulous Averill! How exciting that you can finally cross one room off of your list! And JC Penneys? Who knew! I actually use their window treatment department -- but never ventured further afield. I may, next time I'm in the market for home accessories! Great job and now I can't wait to see what you do with the living room! LOVE, LOVE, LOVE the light fixture. Excellent choice!!! Love the space...light, simple, airy and just the right touches of dark wood to complement the stunning shades of grey!!! looks absolutely lovely! Congratulations on the finished bathroom - your selections could not be more perfect. Thanks for the inspiration! Averill, it looks PHENOMENAL! I love all of your choices. The little stool is so cute and the zig zag rug is bananas. Fabulous job! very very pretty! love the material and the grey walls. I'm not very loquatious today, so I'll just say NICE! Very restful! Oh, you are a girl after my own heart. You bought a "perfectly good, brand new" (as my mother would say) vanity stool and tore it apart to make it your own. Doesn't that make you so happy? To get a completely custom look for a few dollars and a great idea? JCP is my favorite souce for new items that need a makeover. Love your room. Ha. LOVE the title. And the lovely way you gave a shout-out to the inspirers. You've done SUCH an incredible job. Just lovely. And what a great pelmet builder you are! It's a gorgeously elegant yet practical touch in a bathroom. Enjoy all your hard work! Averill, this is gorgeous! I love that you got creative with less expensive pieces so you could get the pricier fabric and rug that you love. I still can't get over the price of the light fixture - I thought for sure it would be like $400! I wish you many happy bubble baths in your new bathroom! SO AWESOME!!! Your DIY touches turned out so great, and the bathroom definitely looks *you*. It's fabulous!! Averill, you have a gift for this! I was sure that you had the pelmet custom made. I just adore all of your choices. I hope you enjoy lots of hot baths now that the work is done! What a chic spot to primp, Averill. Your choices look spectacular together as a whole. Looks great! Love the archipelago fabric. Bravo! I would love the MW rug for my kitchen (in that exact size/ pattern)! Would you be willing to give your readers a ball park price for what you paid for it? Anon: Sure! With taxes and shipping, the total cost for the 3.5x5.5 size came out to $404. Obviously, if you live near an ABC Carpet & Home, you can save yourself the $45 cost of shipping. Well done. Glad you like the stool-it looks great. Thanks for mentioning Chinoiserie Chic. Looks great and I loved the story of how various blogs have inspired you. I am finding the same with my projects. You did a great job with the window topper and the trellis foot stool. Must feel great to have one room "done." Congrats! Isn't it so nice to mark something off your list? My favorites are the light and the rug. WTG! Looks awesome! It's such an accomplishment to finish a room in your home. I've been in mine for two years and only have two finished rooms...it takes patience to wait for fabric and furniture to arrive, but when it does, it's worth it! Congrats. Isn't Paloma fabulous? I don't know how I missed this JC Penney (incredible find) stool, but perhaps it was because I didn't have the custom vision you had, which makes it even more appealing. If our New York City abode had the bones to make a bathroom such as yours, I'd be so glad to have your eye beside me! Averill, it looks AMAZING! The WS fabric is perfect, and the Weinreib rug, well, let's just say I'm a bit pea green! the door color in my guest bedroom is a custom color. it is sort of sage/olive green. If you like it, I can send you the formula. I posted it a few weeks ago. you can find it under "paint"
OH well done! I love all the special touches that make the room uniquely yours. Great work! 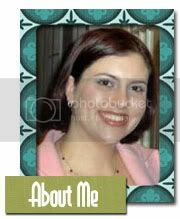 I am totally into your blog! Great images, good writing. Looking forward to seeing and reading more! Another bravo to blogging. Averill it looks magnificent. The light fixture sets for all the gorgeous pieces you chose. Great job! wow, that's beautiful! i'm impressed! A lovely place to suds up. Anon: I too would love to see some art on that wall -- and if this were for a showhouse instead of my house, I would've. Alas though, that wall is the only spot to put a towel rack in the entire bathroom, so practicality dictated function over form. I am, however, contemplating doing an inset of wallpaper, framed out with molding, on that wall. Would make a sort of interesting "frame" for something as mundane as the towel rack, don't you think? I just found your blog and I'm loving it! When I saw this post, I had to stop! It's beautiful, btw! Great job! 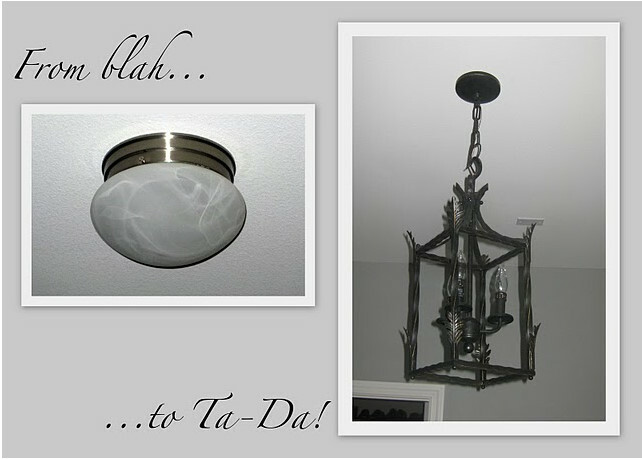 I am so loving your light fixture and have searching endlessly for one like it!! I looked at the dimensions and I'm wondering if the light is adjustable? I have low ceilings and 22" length is too long. Love the bathroom redo! I have been wanting to redo my master bath for quite some time and love your cabinets. Did you paint them yourself and do you know the color? I am also redoing fixtures and love the idea of the hanging pendant light fixture. Unfortunately it's no longer available so I'll be on the lookout for a similar one.